Three of the UK’s most popular and internationally successful musical theatre stars have joined forces to record a critically acclaimed new British musical. 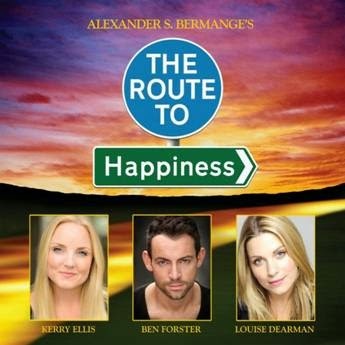 Kerry Ellis, Ben Forster and Louise Dearman appear on the new recording of Alexander S. Bermange’s three-person musical The Route To Happiness, which was embraced by critics and audiences alike during its run at London’s Landor Theatre last year. This album of the complete show includes new and re-conceived material that BBC comic songwriter Bermange has created for the musical since its premiere production, and is produced by Mike Dixon, one of the UK’s foremost Musical Supervisors. The Route To Happiness charts the individual and interweaving experiences of three present-day Londoners in pursuit of their respective dreams: finding love, making money, and becoming famous. A musical with humour and heart, listeners will be amused, moved, and possibly even made to question their own desires and goals. The Route To Happiness is to be releasedon Monday 8th December 2014 on the Spectacular Music label. It will be available both as a deluxe 2 CD set from Amazon and Dress Circle, and to download from iTunes and all major digital platforms. A trailer can be viewed at http://youtu.be/KIfJbhnLjmw. To coincide with the release of The Route To Happiness, the recording of Alexander S. Bermange’s earlier musical Shadowless is to be released digitally on the same date. The show, which won two awards at the Musical Festival Graz in Austria, tells the story of a man who sells his shadow to the devil, and the recording features seasoned West End performers James Gillan, Sarah Lane,Michael Cormick, Rachel Izen, Alan Ruscoe, Tony Kemp, Caroline Deverill,Susan Stevens, John Tallents, Andrew Hutchings, Melitsa Mace, Christopher Middlebrook and Melanie Tate.